Seventeen-year-old Alice Marie Krayenbraak is beautiful, witty, a star student, and a gifted athlete. On the surface, she has it all. But in Alice's hometown of Dutch Center, Iowa, nothing is as it seems. Behind the fa ade of order and tidiness, the family farm is failing. Alice's mother is behaving strangely amid apocalyptic fears of Y2K. And her parents have announced their plans to send her special-needs sister Aldah away. On top of it all, the uniformly Dutch Calvinist town has been rattled by an influx of foreign farm workers. It's the fall of senior year, and Alice now finds herself at odds with both family and cultural norms when she befriends and soon falls in love with Nickson Vang, the son of Hmong immigrants. Caught in a period of personal and community transformation, Alice and Nickson must navigate their way through vastly different traditions while fighting to create new ones of their own. Funny and provocative, amusing and unsettling, The Fall of Alice K. marks a watershed moment in the publishing career of author, Jim Heynen. A widely published author, Jim Heynen is perhaps best known for his collections of short prose featuring young farm boys: "The One Room Schoolhouse" (Knopf, 1993; Vintage, 1994), "The Boys' House" (Minnesota Historical Society Press, 2001), "You Know What is Right" (North Point Press, 1985), and "The Man Who Kept Cigars in His Cap" (Graywolf, 1979). His most recent collection of poems is titled "Standing Naked: New and Selected Poems" (Confluence Press, 2001). He has written two young adult novels, "Cosmos Coyote and William the Nice" (Henry Holt, 2000; Harper-Collins, 2001) as well as "Being Youngest" (Henry Holt, 1997), and one major book of nonfiction, "One Hundred Over 100" (Fulcrum, 1990), which featured one hundred American centenarians. He has frequently been featured on National Public Radio reading his own stories and has been awarded National Endowment for the Arts Fellowships in both poetry and fiction. Jim Heynen lives in St. Paul with his wife Sally Williams, a former books editor of the Minneapolis Star Tribune. 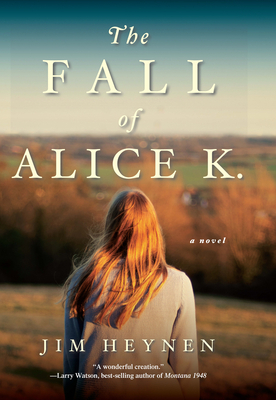 Praise for The Fall of Alice K.
"Meeting Alice Krayenbraak takes readers back to their own high school days but don’t mistake The Fall of Alice K. for a coming-of-age novel. Minnesota writer Jim Heynen’s lovely tale of the small and not-so-small minds of the Midwest in 1999 is much more." "What Heynen does with describing the Dutch community and the Iowa landscape harkens to writers like Willa Cather and Annie Proulx." "Alice's navigation of the rough seas of first love, oncoming adulthood and a familycrisis might be an effective metaphor for what the larger community is facing at the turn of the millennium but it doesn't read like a metaphor. It is, in keeping with Heynen's considerable gifts, painstakingly particular, immediate and moving...a finely focused, perfectly calibrated story of finding a balance between the forces that govern society, settling and striving, putting down roots and reaching for the light." "Heynen's gorgeous sense of place is in every detail....Heynen's prose is especially poignant when he's writing about failing farms....There is a darkness at the center of this book, which begins with Alice hearing gunshots as a neighbor kills 80 hogs to protest falling prices. It ends with Alice looking to a future that will leave readers debating whether this smart young woman deserved this 'fall.'" "The Fall of Alice K. follows a 17-year-old girl as she negotiates the widening cracks of her Iowa childhood: a failing farm, a superstitious mother, homogeneity broken by Hmong immigrants. To pry prophetic revelation from her story, Heynen leans on his own strict Protestant upbringing, plus plenty of well-chosen words." "If only there were more unruly girls like Alice K., unwilling to submit to dogma or tradition the world would be a better place." "Alice's navigation of the rough seas of first love, oncoming adulthood and a family crisis might be an effective metaphor for what the larger community is facing at the turn of the millennium but it doesn't read like a metaphor. It is, in keeping with Heynen's considerable gifts, painstakingly particular, immediate and moving . . . Hers is a finely focused, perfectly calibrated story of finding a balance between the forces that govern society, settling and striving, putting down roots and reaching for the light." "I’ve been a fan of Jim Heynen’s small stories about the boys for years. How wonderful to meet one of the girls on the farm, and someone as bright, courageous, complex and real as Alice. Jim Heynen’s depictions of small town Midwestern life are spot-on, and Alice is a character to root for. This is a terrific novel, at turns funny, heartbreaking, touching and poetic a compelling read that just keeps getting better and better. I loved this book." "Wise, wryly humorous, and aching with tenderness for his characters, Jim Heynen has here gifted readers with his finest and most poignant book, a masterpiece of rural fiction." "Long a true master of the very short story, from The Man Who Kept Cigars in His Cap on through The One-Room Schoolhouse, Jim Heynen shows himself wonderfully adept in his lovely first novel, The Fall of Alice K. For those who've known the heartland farm country Jim has written from, this new book contains familiar terrain but deepens and varies it, movingly (and it is a story of a changed Midwest). For those who haven't met his work before, you are in for a readerly treat and many surprises. He writes of the simplicity of the complex, and the complexity of the simple better than anyone I know, Midwest and otherwise." "Heynen’s poetic language vividly depicts the grinding strain of life on a struggling farm and the strict moral code of the Protestant farming community. Heynen finely portrays the complicated character of Alice, a girl at the brink of adulthood with a promising future but naively willing to put it all at risk for the recklessness of first love." Jim Heynen can be funny, or serious, or both at once; and he appeals to young and old. They stand in line like Oliver Twist after his readings, to catch a little more. And that porridge is good, nourishing, delicious. It sticks to our shaking ribs." He is a storyteller for the ages. From the ages. For more than 20 years, this backwoods poet has been telling of life on the American farm with a half-smile and a raised eyebrow. His is the archetypal voice: sage, preacher, scribe, storyteller, wit. . . . Like Wendell Berry and Kent Haruf, who have staked rural America as their turf in long fiction, Heynen is the Pied Piper of farm life in short fiction."